Australians might drink more beer than wine when it comes to quantity but wine is now the most popular alcoholic beverage. The Roy Morgan Alcohol Currency Report released this week reveals 69.3% of Australians 18+ drink alcohol in an average 4 week. 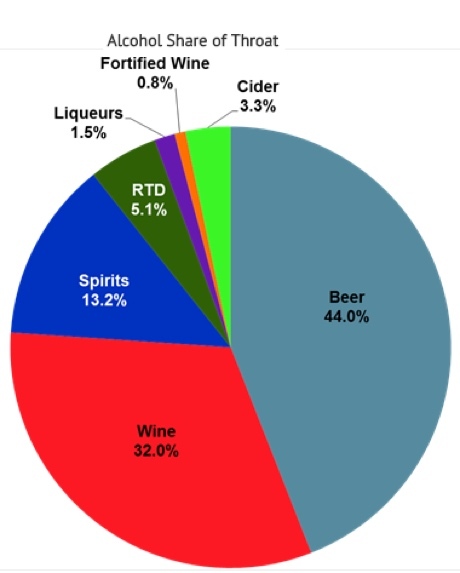 Of all Australians 18+ years old, 44.5% consume wine, 39.1% consume beer, 27.5% consume spirits, and 13.6% consume cider. When looking at drinkers by gender, men are the predominant consumers of alcohol, with 74% consuming alcohol in an average 4 week period, compared to 65% of women. Women had the highest incidence of wine consumption, with nearly 50% of all women drinking wine in an average 4 weeks compared to 39% of men. Wine skews to older drinkers, with the highest incidence among 50+ and 35-49 year olds. In contrast, beer is consumed by 59% of men in an average 4 weeks, compared to only 20% of women. Beer is fairly constant across age, increasing slightly from 18-49, but declines for the 50+ age group. Cider is fairly evenly split between the genders with a slight skew towards women, but it is heavily skewed to younger Australians compared to old, with 27% of 18-24 year olds consuming cider in an average 4 weeks compared to 7.8% of 50+. 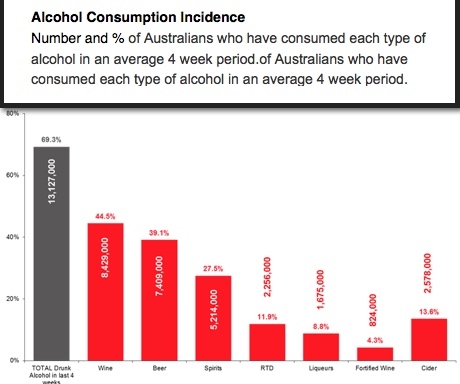 While wine is the most popular choice of alcoholic drink among Australians, it’s interesting to note the largest volume of alcohol is beer, representing 44% of all alcohol in a 12 month period. There has been a decline in alcohol consumption among men, who in the last 5 years have gone from 76.5% consuming alcohol to 73.9% in an average 4 week period. This is contrasted by the rise of women consuming alcohol, which has increased from 64.1% to 64.8%. Young people have also declined in alcohol consumption, with 18-24 year olds decreasing from 71.8% alcohol consumption to 68.1% in an average 4 weeks. This is compared to 50+, who have increased from 69.4% to 70.2%.